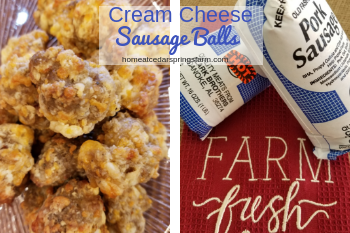 These Cream Cheese Sausage Balls are a delicious treat for any holiday party, game day, brunch, or any occasion. They are made with only 4 ingredients and they come together super fast. Just mix, bake, and enjoy! Sausage Balls have been around for as long as I can remember. It is rare for me to go to a party and not see sausage balls on a table. I carried these little bites of goodness to a party last week, and they disappeared within minutes. They are certainly a classic party treat. With only four ingredients you can have these balls mixed up and in the oven in just a few minutes. Yes, only four ingredients are needed–sausage, cream cheese, Bisquick and shredded cheese–to make these perfect and delicious treats. I have tried many recipes over the years, but this is by far the best and the easiest sausage recipe in my file — the secret ingredient… cream cheese. The cream cheese keeps the sausage balls moist and from drying out. Once you make these sausage balls using cream cheese, you won’t make them any other way. They are super simple to make and taste amazing. They are great warm from the oven or served at room temperature. If you need a few for breakfast, reheat and enjoy! These can be made ahead of time and frozen. Who doesn’t love a make-ahead appetizer? 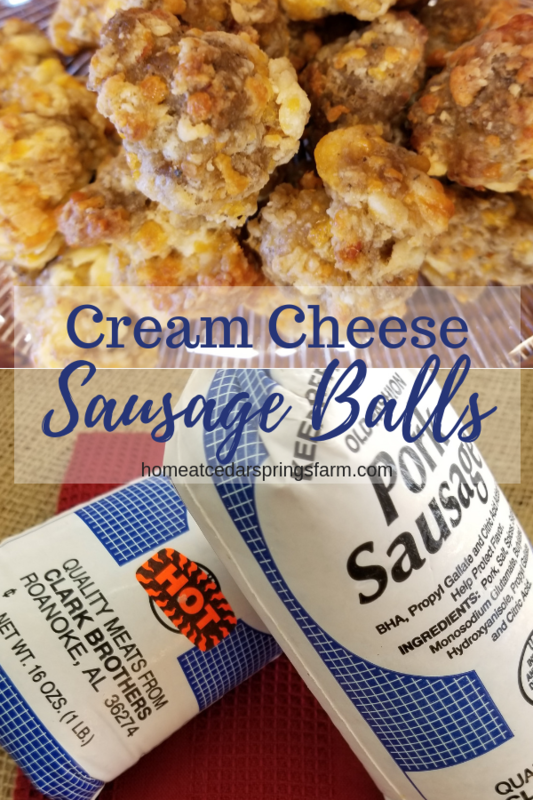 Try these Cream Cheese Sausage Balls today. I promise you won’t be disappointed. 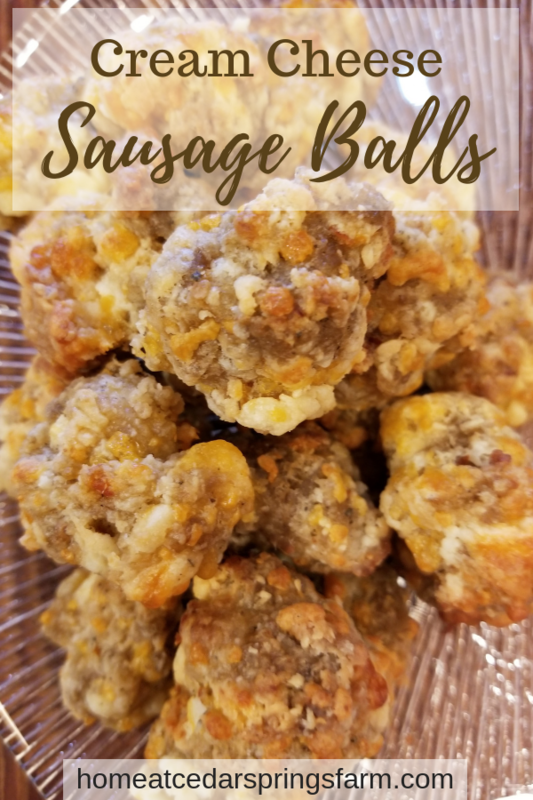 I wonder–why do I only make these Sausage Balls during the holidays? Mix all of the ingredients together and roll into 1 inch balls. You can make these ahead of time and freeze uncooked. When ready to bake, take out of the freezer, put on a pan, bake as directed. You will need to add a few minutes longer for frozen sausage balls. Tip: To make ahead and freeze—roll the sausage balls out, place on a baking sheet and freeze. Once frozen, pop them in a zip top bag and leave in the freezer until ready to bake. Bake as directed. Bake as many as needed. No defrosting required. These can be stored in the freezer for up to a month or longer. Tip: To make ahead and freeze---roll the sausage balls out, place on a baking sheet and freeze. Once frozen, pop them in a zip top bag and leave in the freezer until ready to bake. Bake as directed. Bake as many as needed. No defrosting required. These can be stored in the freezer for up to a month or longer.